CheckVideo CloudVMS is a Cloud-based suite of software services that provides seamless CheckVideo device monitoring by a central station, and is used to send real-time alerts to smartphones and emails for viewing of live, recorded and event video online. The CloudVMS package includes setup, configuration connect, overall video management to include alert scenarios, a video search engine, cloud video storage, and an alert system where messages are sent out via smartphone or other medium. 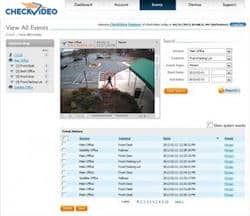 The CheckVideo CloudVMS is a Cloud-based video surveillance software platform that integrates seamlessly with leading central station automation software, sending video alerts to the command center or central station for immediate assessment and response. It works with all CheckVideo devices and enables them to be easily configured and managed remotely. The CloudVMS is available through just an Internet connection, and the package includes setup, configuration connect, overall video management to include alert scenarios, a video search engine, cloud video storage, and an alert system where messages are sent out via smartphone or other medium. 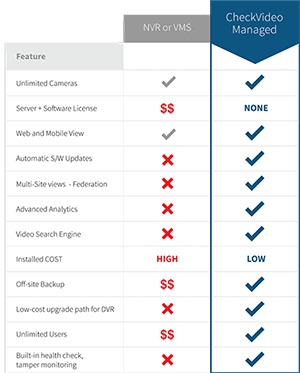 That technology is capably provided by CheckVideo, with its CloudVMS and simple, intelligent solutions designed to remove much of the complexity involved with a video surveillance system.